IT HAPPENED IN LA’S AFTERLIFE, last Saturday. After the opening of the Broad, after Sprüth Magers and Hauser & Wirth, and even after some kickback to the fantasy of Los Angeles as art paradise (in small waves of transplanted New Yorkers and others returning east), another seismic contemporary art institution touched down on a heretofore native stretch of Wilshire Boulevard just below the tony flats of Hancock Park. Following a three-year renovation, the Marciano Art Foundation opened its doors in the former Scottish Rite Masonic Temple, designed by Millard Sheets, to immediately become one of the most distinctive art-viewing places in the city. The galleries are a little quirky—the converted opera stage now houses Jim Shaw’s “Wig Museum” funhouse, which incorporates Mason-painted backdrops of hell and other exotic locales; the sunken project space below is christened by a prone colossus sculpted by Adrián Villar Rojas; and the third-floor galleries, with diagonally pitched ceilings lined in lights, feature the inaugural collection show, curated by Philipp Kaiser—but the building blends indoor and outdoor in a way that every space of means ought to in Los Angeles. And, most unique, it incorporates a handful of elements carried forth from its supremely odd provenance. The forces behind the project were interrogative: The architects were Kulapat Yantrasast’s firm, wHY. And the money? GUESS—the 1980s to 1990s street-wear brand owned by Italian brothers Paul and Maurice Marciano, the latter of whom has cochaired MOCA’s board since 2012. “I could totally see that inverted triangle coming back,” said Negar Azimi, arriving on the scene with Angeleno-emeritus and MoMA chief curator of media and performance art, Stuart Comer. Some five hundred guests streamed onto the grounds in a daytime, Oscars-like procession of evening wear. A photograph of Cindy Sherman in Mason regalia greeted guests in the lobby. The wraparound mezzanine above is the site of an Alex Israel mural of sparsely spaced parking meters, desert flora, and other iconic signifiers from around the city (such as the Beverly Hills sign). The artist even brought a walking, talking signifier—Sharon Stone—as his date. Stepping from the top-floor galleries onto the terrace facing the Hollywood Hills, drenched in late sun, I ran into NorCal dealer Jessica Silverman: “I didn’t go to Venice [Italy], and I’m skipping Basel, but now I feel I don’t need to go anyway: Everyone is here.” It was true. Surveying the room and the parking lot below—its expanse transformed into an outdoor lounge, dance floor, and impromptu kitchen featuring colossal pans of simmering paella—there were Europeans galore: LUMA Foundation founder Maja Hoffmann, dealer Eva Presenhuber, and adviser Patricia Marshall. There were also a lot of unknown teenagers—GUESS models? 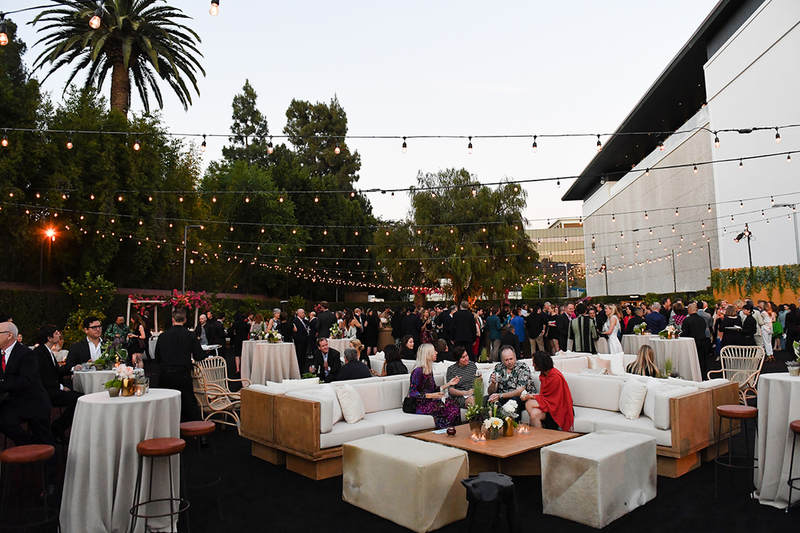 One New Yorker commented on how LA the scene was, meaning that important art-world people were mixing with the most random, extravagant locals who seem to only leave home to attend events like museum openings. As long as I stayed, there were no remarks and no ceremonies, just smooth house music and copious hors d’oeuvres powering a block party for millionaires and their friends. The last time I had been to the building, it was full of drones, camping gear, and fiendish squeals. The Marcianos had made the space available to Lizzie Fitch and Ryan Trecartin to build sets and shoot a film, which they did for the better part of six months, and which is now on view in the second-floor gallery under the canopy of a massive mother tent. While there is a room off the Israel mural devoted to a mini-exhibit of Mason memorabilia, and though a couple incredible mosaics remain, winding up the staircases I recalled that just two years ago there were peculiar, Lynchian passageways; now they are sanded, whitewashed, and blasted in cold light. The replacement of one cult-like tradition for another brings to mind concerns about the original responsibility of art museums: to preserve culture for future generations. While what’s on view here of the Marciano collection is not as comprehensively blue chip as what would be at the Broad, there are zero surprises. There are works by LA’s best-known artists: Sterling Ruby, Laura Owens, Paul McCarthy, Jonas Wood. Some, like the Mark Grotjahns, are supplemented by works on loan—an unusual choice for a show that’s meant to edit down an already too-huge collection primarily amassed over the past ten years. As for foreigners, there’s Takashi Murakami, Albert Oehlen, and Christopher Wool, to name a few. While the MAF is refreshingly unlike the Broad, details such as these suggest that this might owe more to a difference in budget than ideology. What may better distinguish the MAF are Maurice Marciano’s comments regarding how his patronage may affect Los Angeles in the long run. He assured me that he had no plans to leave his post at MoCA, explaining that, “I created my own museum as a place to do what I want to do,” a healthy impulse for a trustee of a public institution indulging the desire to have a private museum, and that, while the MAF is not yet endowed, one day he would like it to be. Would that mean fundraising and creating more competition with the aging public museums? “No,” he said, “I hope not.” I hope not, too.